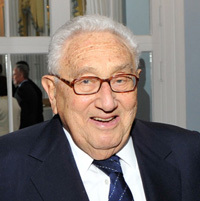 Henry Kissinger was interviewed for the Gerald R. Ford Oral History Project on April 8, 2009 by Richard Norton Smith. Smith: You obviously had contact with Congressman Ford before he became vice president. Smith: What was that like? Was it before the Nixon presidency? Kissinger: It was well before the Nixon presidency. It was well before I was Henry Kissinger. It was when I was a professor at Harvard and I ran a seminar called the Defense Policy Seminar, to which we invited people with practical experience. We invited Jerry Ford to meet with that seminar and tell them about the legislative process with respect to defense. Then afterwards Ford kept in contact with me, occasionally calling me when there was some issue. Neither of us ever thought we’d end up in the White House, much less together. We had a warm relationship before then. Smith: When you look back was there a moment, whether it was the smoking gun tape or the Supreme Court decision or whatever, that you, in your own heart, thought spelled the end of the Nixon presidency and the transfer of power? Kissinger: I have to say two separate things about that. The power was sort of flowing away. That was noticeable for months. But you sort of got used to that and you thought that this might go on for the rest of the term. It wasn’t obvious to me that there would be a specific climax. Smith: Is it possible that everyone was avoiding the most unpleasant of subjects? Kissinger: No, it was the tactful thing to do. What was I going to say? I was already secretary of state. I was both secretary of state and security advisor. Anyway, it was the tactful thing to do. Then the next day there was a Cabinet meeting at which there was sort of a rebellion of the Cabinet members. They were saying they needed the full disclosures. And Ford – it’s all described in my memoirs – Ford was very tactful. He just spoke of consequences of what needed to be done, but there was no talk of resignation by anybody at that meeting. It’s unprecedented that at a Cabinet meeting Cabinet members speak against the president. Ford didn’t speak against the president; he just laid out what would happen in the pursuit of the issues that were before us – not the Watergate issues, but the business issues. And from then on it accelerated. Then Ford called me, I think on Thursday morning, that he wanted to see me. By that time it was clear that Nixon would resign. He called me, I guess it was either Wednesday or Thursday, and he asked me for the meeting. You can look it up in my memoirs and the phone records. Smith: It is interesting that yours is the only name, of course, that he mentioned the night after the president made his resignation speech. Smith: When he went out and met with the press outside his home in Alexandria. Kissinger: I’m not rational about Ford, both my wife and I love him. Smith: Let’s back up just a bit because you, obviously, did spend a lot of time with him while he was vice president. Kissinger: Yes, I briefed him at regular intervals, every two weeks. Smith: Tell us about your impressions about his intelligence. He would sort of listen to people and distill their thoughts. He was a very good judge of people. He treated them in an open and trusting manner. If you ever lost his confidence, then you were in trouble. If you ever did something that he considered immoral or unreliable…But he handled disagreements – you never had to worry that if you disagreed with him that it would be taken as a personal event. Now, the reason I raise that is, because we know that John Connally was Nixon’s first choice for the vice presidency. I’m trying to get a sense of what Nixon, and to some degree, the immediate folks around Nixon, thought about the vice president. Kissinger: Well, I don’t know what the people around Nixon thought. I know what I thought. I thought very highly of him. I never thought of him as a president because he wasn’t on a career path that would lead to the presidency. But I had heard Nixon say the same thing. But he might have said that about 99.9% of the universe. He might have said it about Nelson Rockefeller. He wouldn’t say it about John Connally. Smith: What was it about Connally? Kissinger: Nixon had the subconscious hope that when Congress looked at any of the likely alternatives, they would conclude that it was too dangerous – and it was dangerous – to make a change of presidency in middle of a whole series of crisis, and in the middle of the Cold War. But he did make these observations and he turned out to be wrong. Smith: That raises a large question. We’ve talked to a number of folks who were there on the 8th and the 9th, and particularly for the swearing in on the 9th of August. Afterwards, I guess there was a receiving line, and then there was a reception in the state dining room, and several people have had the same observation that – and it’s not surprising – that you could see the Nixon people peel off. I raise that in the larger sense of, how much of a challenge was it for the new president to integrate, to be fair to, to weed out – how much of an issue was that in terms of fashioning his administration with his own stamp? Was there passive resistance? Kissinger: Once the presidency had moved, changed, there was not scope for passive resistance. You can’t resist the president in the White House. There was the practical problem of people, in the midst of doing certain things, how they were going to turn over, and secondly, at what speed Ford would replace them. The only part of it that I knew was that quite a few of them called me up and asked me to intercede with Ford on their behalf. I took the position that I couldn’t do that – that I would stay out of domestic affairs. In my part of the White House activities Ford left it up to me what staff I had. He made no attempt to change any of my staff members. We kept going just as before. He took on, in the first few days, the problem: how do you make a transition for foreign leaders – that we still have authority in Washington? He took on a staggering load. We arranged meetings with the ambassadors of each region. So we had the Africa ambassadors, the European ambassadors, the Asian ambassadors – there were five or six groups. Each of them took about an hour because Ford had to say something, and we sort of outlined for him what the themes were that we were pursuing, but he wasn’t reading a script. So he would meet with these ambassadors, talk for maybe twenty minutes, and then give them a chance to ask questions for another half hour. But you just add this together, that’s six hours right there. Then he saw one-on-one the ambassadors of Russia – of the Soviet Union, of China, I think England, some of the key NATO allies. You have to look up whom he saw. Kissinger: We have a list. And you add all of this together, that’s a staggering load and he did it with calm, equanimity, he never made a false step. Vietnam – he saw the ambassador. Then we sent out a bunch of letters around the world. Now, again, the staff work was done in my office but Ford was heavily involved. All I’m saying is take the first three dates then, on the second day he was in office, the Cyprus crisis blew up. Smith: Plus you also had the Glomar Explorer affair that day. Kissinger: Yeah. But that was interesting, you can’t say it was a fun part of the presidency, but it was something we had done. Smith: Did he know about its existence? Kissinger: No. I knew about it, I sort of knew they were doing it. I wasn’t following it. But he handled the transition with calm, dignity, and authority. Kissinger: Yeah, that came, not in the first week. Smith: Did you talk with Governor Rockefeller during that period? Kissinger: I talked to the president. I was so close to Rockefeller that everybody knew that I was for Rockefeller. If you go through my phone calls you’ll find that a number of people called me up and wanted me to support them, and I always said, “I can’t do it because I’m basically for Rockefeller.” So then they said, well if he doesn’t get it…But I was not involved. Ford did talk to me about it, peripherally, [he] wanted advice. But I was not a factor in the Rockefeller nomination. Ford got to that by himself. Kissinger: Now, that I did discuss with him. Smith: Yes, he said you were the one who, in effect, talked him out of it. Kissinger: I told him he must not do that. That he’d become a lame duck immediately and that then everything would be geared to his succession. And he accepted that view. Smith: Was it difficult integrating the Capitol Hill crowd, the Grand Rapids crowd, the Nixon crowd, his old Congressional buddies? Kissinger: I’m not a good judge because I saw him every morning for half an hour to an hour, whether we had business or not. He and I took the view that it cannot be that there is no business between the president and the secretary of state. So if we didn’t have a crisis, we talked strategy. So, yes, the Capitol Hill crowd, as you’d expect, the Ford people coming in fresh, wanted to make a mark for their president and to show distinctions, and it would show up in occasional press leaks. But those were incidents; they were not major elements because I had the great confidence that Ford would never do anything behind my back. So whatever criticism we had I’d hear from him. Smith: Did he criticize? Was there criticism from time to time? Kissinger: It didn’t happen that way because he and I had such a warm, personal relationship that sometimes he didn’t agree, but it never got to a confrontational issue. I sometimes modified my position, it could have happened, but I don’t even remember a clear case where I said, “Let’s do this,” and he’d say flatly, “No.” On the other hand, he was a strong leader. I’m not a good judge here, I could mention incidents and some of them mentioned in their memoirs where they think they scored great victories. But it didn’t affect any real thing. Kissinger: First of all, let me first talk about that Lithuanian. There was an outrageous incident where the Coast Guard had turned over a defecting Soviet sailor to the Soviets. So, at the first meeting with Dobrynin, without any advice from me – I was sitting there, the secretary of state – Ford said he would appreciate it if the sailor were released. He was a Soviet citizen and Lithuania was part of the Soviet Union at that point, he was a Soviet citizen. He had defected. We didn’t have a leg to stand on, except for humanitarian considerations. That was a typical Ford move. No advice from me. I was stunned when I heard him say it. But it worked. Then Solzhenitsyn, and let me make a general comment on the Soviet relations. Solzhenitsyn came about, actually, I was on vacation when the decision was made originally. I think Senator Helms wanted to arrange for a Solzhenitsyn meeting with the president. There was never an issue about a meeting. He agreed from the beginning that he would see him. But what he didn’t want was a media circus about seeing him. And so Solzhenitsyn and Helms had agreed that he would come in, maybe take one picture, a White House photographer picture that you can then release. That would have been no issue. But Ford did not want a media circus about it. He was negotiating with the Soviets at that time about an arms control agreement. It became hugely controversial as a sort of a symbolic issue. The fact, however, is that all the numbers that Ford was putting forward were exactly the numbers that Reagan adopted, and that all the attacks that the right wing made on the SALT agreements when they got into office, they implemented it and didn’t try to change it. So, here is an unelected president coming in at the end of a crisis, in the aftermath of a Middle East war, while the situation is highly unsettled, and it’s the right wing people who were never to be heard from when the going was tough. Suddenly started into a policy of confronting the Soviet Union and picking issues like Jewish emigration, in which Nixon had already achieved an emigration rate of forty thousand, from seven hundred to forty thousand. And after the Jackson people got into the game, the immigration when down to around fifteen thousand and never came back. Smith: I think the number the president cites in his memoir – Dobrynin indicated that as long as there was nothing in writing – that they would be prepared to go as high as fifty-five thousand. Kissinger: Exactly right. Except they could not commit themselves to a number. They might wind up in a position where they would have to expel people to meet numbers. But the Jackson people didn’t want an agreement, they wanted the issue. Ford and Gromyko met, and Gromyko said the number could be fifty-five thousand. So then the Jackson people came up yes, but they have to be distributed evenly around the Soviet Union, or maybe they had to come mostly from Moscow. They put certain conditions, but made it clear that they did not want an agreement and they announced – we told Jackson, we know this, and this is going to happen. Why don’t you watch and see whether it happens. So he stepped out from being told by Ford what would happen and announced it as his success. Then, of course, it blew up again. Not only as his success – but Ford didn’t care who got the success, got the credit – but they announced it as proving that if you put real pressure on the Soviet Union they yield. Smith: To an outside observer, it seemed as though there were real crosscurrents in U.S./Soviet relations during this period. Because on the one hand, you’re building the policies of détente, and yet, at the same time, there are proxy wars going on, particularly in Africa. Kissinger: But that was the nature of the relationship. We had used détente to reduce the Soviet influence in the Middle East originally. We were going to do the same thing in Africa. We were going to tell the Soviets, if you value this relationship, the right wingers wanted a direct confrontation with the Soviet Union, and then when we did that, they passed whatever that amendment was – the Tunney amendment that prevented any real effort in Angola. If you look at the actions of Ford, he was tough as nails on the _________________ issue. He wanted to be tough on the Angola issue, but the Congress cut off the support for him. He wanted to do the honorable thing in Vietnam, which was to not cut off aid to a dying patient, it was more of a symbolic and moral issue. He and I knew very well, at that point, after two years of Congressional cutoffs, where aid went down from two and a half billion to seven hundred million dollars of aid, and the South Vietnamese had to ration their artillery when they got under attack because they were running out of supplies. We knew what the end would be. But it seemed important to Ford, and with full support from me, that the United States not stab a dying ally in the back. So Ford thought it was important to keep going up to the Hill and ask for aid, and even if that aid would never be delivered so that we would not end something in which thousands of Americans had been killed by turning on the people that we’d been supporting. Kissinger: What is he talking about? Kissinger: And why wouldn’t we get it? How did he blame Ford for that? Smith: As far as I can tell, he didn’t try hard enough; he didn’t employ all the power of the presidency. Kissinger: That’s absolute, total nonsense. I went through that. Laird is as much responsible for the mess at the end because he acquiesced when he was advisor to Nixon in the Watergate period. He helped draft a compromise that cutoff military action in Cambodia. But I don’t want to get into that sort of thing. The issue wasn’t seven hundred million, the issue was they had cut aid from two and a half billion to seven hundred million. And Stennis had told us we might get three hundred million in the supplementary appropriation. And that then came before the Congress and the Congress was reluctant. Now it is true that the only two leaders who would defend the position were Ford and me. We couldn’t get the other Cabinet members to go up to the Congress. They’d find ways of weaseling out of it. So, if Laird thinks there was a way to get them to go up there, he knows something I did not, but the Congress was determined. There was no way to get more money. Smith: And isn’t the best evidence of that, or at least evidence of that, the fact that as soon as Saigon fell, they wanted to pull the plug on any money for resettling Vietnamese refugees. Kissinger: Absolutely. They were determined, and it was a serious situation. During the ending period of the Vietnam war I suffered from the illusion that if we could get a decent settlement, an honorable settlement, the right wing would be satisfied with having met our honor and the left wing would be satisfied with peace. And so you’d have a united country. But the opponents of the Vietnam war did not want success. They were afraid that if you could say they succeeded, that we would do it again. Smith: They had a vested interest in failure. Kissinger: They justified their attitude by saying they wanted to save lives. But on that basis, you’d have to quit any war because you can always save lives immediately by not fighting. You pay the lives later. It happened in Vietnam very quickly with the boat people and with the murders in Cambodia. Kissinger: Ford was heroic. He could easily have said, as some of his Michigan advisors said, “This isn’t my war,” but he basically took the position that this is America, this is not a person. Four presidents have been involved here. Smith: What was it like in the Oval Office in those last hours? Kissinger: Well, you should read the phone conversations with Ford when I tell him it’s now. We have to pull the plug because the airport is coming under artillery. The whole debate, say, in the last two months of Vietnam, the only debate was, do we pull the plug right away, or do we keep it going for as long as we possibly can to evacuate as many people as we possibly can? There was no doubt how it would end once the North Vietnamese could put all their army into the South, and we had no right to use any countermeasures. The South Vietnamese army was running out of ammunition and also made some strategic mistakes. But Ford, and I’m going to say I, and of course, Scowcroft and people like that, we thought we had a duty to as many Vietnamese and even Cambodians to get out, so the real debate in the country was, we kept testifying for aid so that Saigon’s morale wouldn’t crumble. Ford had some decisions which ________________ recognized. There were two thousand Americans left in Saigon and we could have taken them out fast, but we took them out in very slow increments, so that we had an excuse for being there with our military establishment – to take out Vietnamese. And we managed to save close to two hundred thousand. I think a hundred and fifty thousand plus Vietnamese. It was a great achievement of Ford’s. Now what was the atmosphere? It was very calm, but I called him, I think it was a Monday night, but I forget, it was at night and said, “Tan Son Nhut airport is under attack and we now have to evacuate by helicopter and we can’t take anymore out.” There were about five thousand people at the airport. Ford said, “Okay.” And then he started crumbling and it took about two or three phone conversations which you can incorporate into this on the record, in which you see he’s giving the order, he knows he’s got to do it. Then he says, “Can’t we do something for these five thousand people that are lining the airfield there?” But he was always calm in crisis. The way it worked was, with all respect, the Pentagon wanted to make sure that if anything went wrong, they’d stick the White House with it. So they meticulously tracked every helicopter with us so that they could say they had an order to get out. And then every hour or so, I’d give Ford a report. I didn’t report every single helicopter to him. It was a sad period, but we weren’t there wringing out hands because we had this evacuation to do. Kissinger: He was never despondent. When you’re in real trouble, despondency doesn’t help you. But, anyway, that wasn’t his nature. Smith: The relationship with Secretary Schlesinger – was it just bad chemistry or was it more substantive than that? Kissinger: No, actually, I think if you’d given Schlesinger truth serum, he would have agreed with Ford and me. But, I think the relationship with Schlesinger is best summed the following way: I once said to Ford, “It’s a pity that you have to keep adjudicating disputes between Schlesinger and me.” He said, “Henry, you have to understand the following: Schlesinger’s fight is not with you, it’s with me,” he said, “He thinks I’m a dummy, and he thinks I have to be run by somebody, and he thinks you’re running me. And this won’t stop until either I make him believe he’s running me, or I fire him.” And that’s what happened. Smith: Which was a very shrewd reading. Kissinger: Very shrewd, and it takes a strong man to say, “He thinks I’m a dummy.” But it sort of grated on Ford that Schlesinger would come into the job with his high IQ rapping and putting a leg over…you probably picked that up elsewhere, too. Kissinger: The cruise missiles were put into the budget by Nixon. The Pentagon had wanted to cut them out for budgetary reasons, and we had put it in. You know, Rumsfeld is a smart guy, but he thought his political future was tied to not getting the SALT agreement because the right wing would never forgive him for having the SALT agreement. So he developed incredible ingenuity in coming up with things that backfired. The cruise missile, nobody wanted to bargain away the cruise missiles, because we had wanted them in the budget to begin with. There probably was some technical point, they probably had some _______________, but that wasn’t the issue. We wanted to be sure of cruise missiles. When you get into the legalistic fine points of SALT agreements, you could always find something. Of course, you have to give something up, but we never thought we were giving…it was never an issue to give up cruise missiles. Smith: The Helsinki Accords -which of course are a classic example of how history rewrites contemporary judgment – I take it there was some dispute between some, at least at the Pentagon, and yourself. Kissinger: Well, the right wing view was that we were recognizing the borders of the Soviet Union, which is technically what we didn’t do. There was a clause in the agreement that said, “Borders can be changed only by negotiation,” which meant that borders could be changed. There was nobody who was advocating starting a war with the Soviet Union. At that time the conviction was that the Soviet Union had much superior conventional strength, and you never hear that argument anymore. Because the agreement that was made in Helsinki was the precise pages(? ), which made it possible to undermine Soviet rule in Eastern Europe. Kissinger: Look, you have a lot of retroactive heroes. There was some mumbling going on, but I say that there is no tension until somebody says something. You find me at any point in which Rumsfeld actually objected to something Ford was going to do. Rumsfeld’s skill was to screw up the bureaucratic process in such a way that no substantive discussions could take place. He didn’t have the right people for the meeting, he didn’t have the papers, so he achieved what he wanted – to drag it into the primary season. And then Ford decided that he couldn’t fight a detailed battle on these issues. One, he was conducting a primary campaign. If there hadn’t been a primary campaign, it was very easy to come to an agreement. At that point we had the back of it broken, and it became the basis of what later emerged. Have you talked to Scowcroft about this? Smith: Not yet. He’s on the list. Kissinger: Well, talk to Scowcroft, he can give you chapter and verse. Smith: Quickly, speaking of the ’76 primary campaign: the question came up, of course, just on the eve of the Texas primary, of whether you would go to Africa. Kissinger: Well, it didn’t come up that way, but the way Ford and I worked, I could tell him what I needed to do. Sometimes he might have a different – I can’t think of when he had a different view – but never did he say, this is politically not good for me, on any issue. Nobody will ever have me around for my domestic political judgment. But before I went to Africa, I said, “Now, you know, Mr. President, when I get to Zambia, I will make a recommendation for majority rule in Rhodesia. That’s a big change and you have to tell me whether this interferes with your primary season. I don’t know that.” And Ford said, “We conduct foreign policy of the United States, we don’t do it for primary campaign reasons.” And so I made my speech a week before the Texas primary, it was a disaster. Kissinger: Well, it helped lead to a huge defeat for Ford in Texas. But, again, like so many things Ford did, it turned out to be what happened. Smith: And at the convention, we talked to Stu Spencer, among others, who said this thing, obviously, was very close, and the one thing that Stu and those folks didn’t want was to give the Reagan people an emotional issue. Kissinger: Yeah, it was a political mistake. We had to do something because there were thirty-five thousand Cubans in Angola and we didn’t want the Communists to dominate all these independents’ movements. Could we have waited three weeks? Probably. Kissinger: I was not involved in the convention discussions. I didn’t come to the convention until everything was already done at the end. As a matter of principle, as secretary of state, I took the position, “I can only tell you what I believe to be in the American national interest. I can’t tell you what political assessments you have to make.” I didn’t like the platform. That’s absolutely true. But I didn’t really fight. They knew I didn’t like it, but I don’t think you will find, other than their knowing I was not thrilled by it, I didn’t do much about it. Smith: You’d become an issue, was that awkward? Did the president ever discuss it with you? I think at one point you even offered to resign. Smith: And that was also the time when the vice president was dropped, in effect. Kissinger: That was a big mistake. Smith: Did the vice president talk to you at that point? Kissinger: One of the great things of Nelson Rockefeller – I was as close a friend as he had – that in all the time it’s the one decision of Ford’s that I found inexplicable, and which was wrong. And Ford himself, said that all the rest of his life. But never did I hear Rockefeller complain. I describe it as he had an unbelievable sense of public service and he went through that whole year, which had to be humiliating for him, that last year, never saying to me privately, “This is hard for me.” Never. Nor did he say, “Look at Ford, he brought me in. I went through a humiliating confirmation procedure and a year later he fires me.” Never said that. It was one of the noble things of Nelson Rockefeller. Smith: Did you know about the pardon before it was issued? Did you participate in any…? Kissinger: This will have to be the last thing. I did not participate directly in the discussion with him about it. I had one conversation with him about it because I had had a lunch with one who had been legislative aide to Eisenhower. Kissinger: The Wise Man. We had lunch and he told me and I agreed, that Nixon would never make it through a trial. That he would have some sort of a breakdown, that he could not stand that humiliation. So, as a result of that lunch, afterwards I told Ford that I’d had that lunch, that Bryce was of that view and that I wanted him to know that I was of that view, too. And that I thought the spectacle of putting the president of the United States before a criminal court was something that the country should not have to face. He asked one or two questions, and then the next time I heard from him was the night before he announced the pardon. But not to ask my opinion; but to tell me what he was going to do. Smith: One last quick thing and I’ll let you go. You said at the beginning that you weren’t objective, you were not rational about Ford, what did you love about him? Kissinger: He was a normal American. He did not have the obsessiveness of those who spend three years on the campaign trail. He thought that his job was to do the best job possible. He didn’t care so much about the public opinion polls of every move. He thought his duty was to serve his country, to bring the country together. He was always calm and he was extremely polite to his subordinates. He had a terrific sense of humor. He had a great family life, and when you talked to Ford, what you saw is what you got. So you could absolutely count, and you’d seen everything there was to see when you dealt with him. But he also had great courage. But he never bragged about any of these qualities. If he were here he would be embarrassed to have me talk like this about him. But when you think to his funeral, there was such genuine emotion, and even among the public. When we drove with the casket from the airport into town on a Saturday night – it wasn’t announced – there were people on the street. I think back to my association with Ford as the high point of my governmental life. Kissinger: We loved him. I said we – my wife and I. One of my sadnesses is, he wanted me to come out and see him one more time, and I didn’t realize how close to the end he was. So we set a time, maybe a little further ahead than we should have. I had to go out anyway, on its own, I wasn’t going to charge a plane, I think January 15th, something like that, to see him. And I just missed him. But we talked on the phone, as Penny will tell you. Often – at least once a month. But more often when something came up, he’d call me Or I would call him, and we were on the board of American Express together. Kissinger: Oh yes. He came to the meetings.